The image of the Snow Queen looms over the boy Kai, in this drawing inspired by Hans Christian Andersen's fairy tale of the same name. He sits on her hand which magically extends from the earth and appears to have icicles hanging from it. She will be taking him away for awhile, and only the innocent love of Gerda will save him. 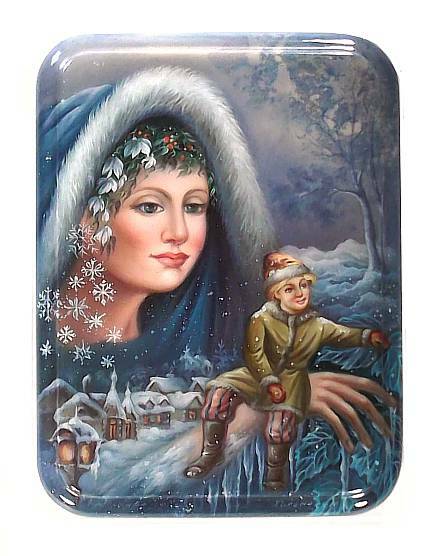 The artist, M. Khasanova, paints a lovely scene, and the face of the Snow Queen is particularly drawn well. 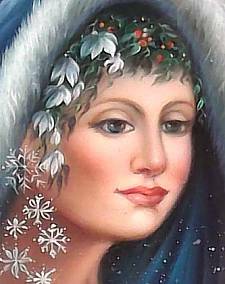 You can see the snowflakes, which she rules over, falling from her ear. The quaint village beautifully placed in the cool wintry landscape also helps accentuate the frigid atmosphere. Both the top and bottom of the box have a base color of blues and whites, though the bottom is slightly darker. There is also a gold line ornament there, as well. The box lies flat and has a hinge at the left. It is made out of high quality papier mache. Signed at the bottom of the composition with the name of the artist and village. 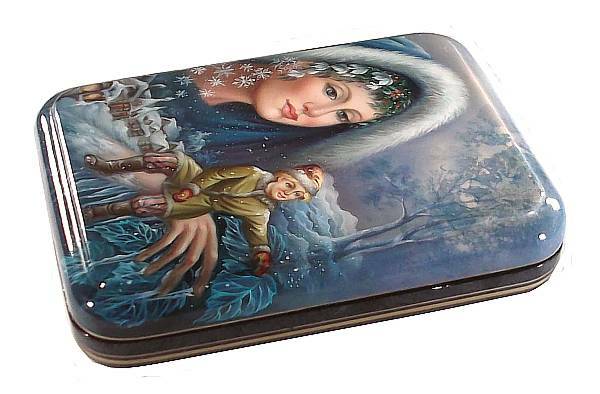 This box is very similar to one that we had on our site in the past by the same artist ( which you can see here ), but there are subtle and not-so-subtle differences in the images and mood, all of just reaffirms the idea that no too lacquer boxes are ever exactly alike.